Thanks to the many who responded quickly and generously to this summer’s Machzor (high holiday prayerbook) campaign, we now have new Machzor prayerbooks for both Rosh Hashanah and Yom-Kippur services at UAlbany. Each Machzor will bear the dedication that each donor sent in as an inscription. 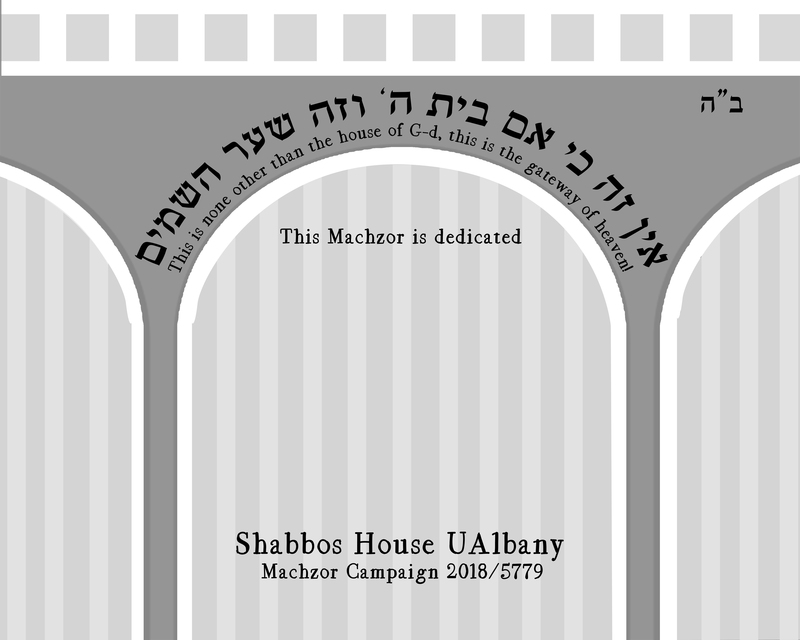 Chani did this inscription design for us, using the motif of UAlbany’s archways, bearing in mind the common metaphor of heaven’s doors and heaven’s gates throughout the high holiday prayer service. The background lines recall the ubiquitous window lines of UAlbany’s architecture (by Edward Durrell Stone) and also somewhat match the inside cover line design of the Machzor. The thicker lines on top are those repeated pattern voids in the concrete at the edges of UAlbany’s roof panels. Jacob was referring to that spot in this way because as the Midrash teaches us that very same spot of his dream later became the Temple Mount, home to the Jerusalem Temple. However Chassidic teaching extends this to also mean that every spot we call home, anywhere in the world, can and should be a dwelling place for G-d, indeed, UAlbany itself can be (through our spiritually transformative efforts) considered a gateway to heaven! We hope that much heart and soul will be invested into these books, each student giving of themselves in prayer, each connecting in their own way, at their own level. We hope these books and the prayers therein will enhance, deepen and strengthen their Jewish connection, adding to the holy opportunities possible in making UAlbany a true gateway to heaven.